What makes ION Strength and Conditioning different from other CrossFit Gyms or Functional Training Facilities? Is it all the Equipment? Is it the fact we are Open all Day? Is it the bunch of standard gym selfie videos that appear on social media? At ION Strength and Conditioning we have built and developed our foundations on 3 Big Rocks that have allowed us to become a leading Functional Fitness Facility in the UK. At ION Strength and Conditioning we pride ourselves on the quality of Coaching we provide our members with. All our Coaches have a vast amount of experience within Strength and Conditioning and have developed the skill set and knowledge to help all levels of ability achieve their individual fitness goals. As coaches, our focus is on developing the correct movement, mechanics, techniques, and sequences that allows for optimal performance in a safe and fun manner within the gym that will enable our members continued progression and development. As well as this, our coaches are highly encouraging, motivating, and supportive that provides a holistic approach to Strength and Conditioning – it’s not just the coaching that is important, it’s the way its delivered that is a priority. Achieving high levels of fitness takes years to achieve. Our goal is to develop members across the ten general physical characteristics of fitness to allow them to become well rounded individuals, fit and healthy in and outside of the gym. Having experienced coaches is key to our members achieving this and understanding the importance of patience and gradual progression along the way. As Coaches, our first priority is to help educate our members how to live a healthy lifestyle – how to eat right, how to recover properly, how to warm up properly, and how to correctly perform the exercises used in our ION training program. Progressive steps and developing technique is key to maximising results. Our coaches communicates this with members – expectations are clear, injuries are prevented, and trust is developed. Our coaches come from a diverse back ground giving us a well-rounded approach to Strength and Conditioning. Robin is the Head Strength and Conditioning Coach of the Professional Rugby Team, the Cardiff Blues, Mike is the Head of Programming for one of the UKs lead competitive CrossFit programmes and is a top CrossFit competitor, Jonny is currently studying his MSc in Strength and Conditioning, Billy has over 20 years of experience in the military as a P.I and developing other P.I’s under his command, BJ has a back ground in American Football and worked as an Orthotist for a number of years building a highly successful business, Conor has recently completed university with a degree in Sports Coaching and has been a CrossFit Regional athlete, Jess has run a successful PT business for a number of years helping individuals achieve all their fitness goals and Jordan, our hugely talented Powerlifting Coach has been a top level Tennis Coach for many years. Fitness equals wellness, that is our goal at ION Strength and Conditioning. Delivering a programme that is structured and planned in a Block format that allows us to have focus and progression from training block to training block. Our ION programming runs in 4-6 week blocks and is designed by our team of Coaches together that allows diversity and quality of content. This allows us to make sure what our members are programmed is sensible, safe and will allow them to see progression. We believe the design and quality of our daily workouts for classes is what differentiates us from most other gyms. The issue CrossFit Gyms often have is that they programme excessive repetitive movements, improper scaling, or complex exercises under fatigue that can leave members sore and possibly injured. This is where its important coaches have the experience and the knowledge base to design sensible, structured programmes with a solid and methodical approach to strength and conditioning that is underpinned by theory and rationale. ION Strength and Conditioning has been programming and tracking workouts for members since 2013. We have collected tens of thousands of results from members. Those results, along with ongoing members and coach feedback has helped ION create incredibly effective programming for all of our members that have a wide level of ability from the complete novice to the more experienced trainer. The quality of our programming is measured by the amazing results achieved by our members on a regular basis. 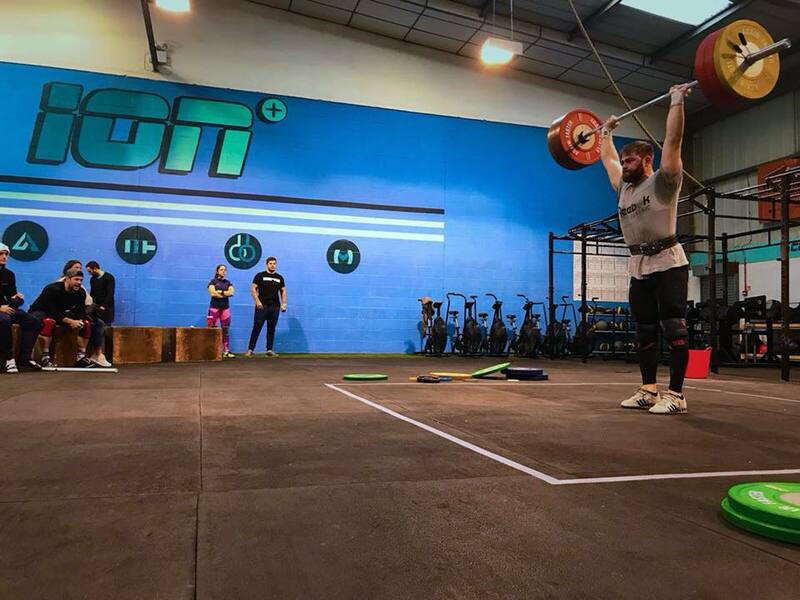 Our Community of members and coaches is unique – we know a lot of newbies join ION as they are searching for a gym where the coaches are highly skilled, the members are welcoming, and the vibes are good and we’d like to believe that is what we provide. Our community sets us apart, and our location attracts a diverse group of driven professionals and fitness enthusiasts from all walks of life that sees friendships being formed. Friendships are formed that then helps members stay engaged and motivated to attend sessions. Accountability is key in achieving results. A lot of people quit gyms and training programmes but friendships help our members stay engaged and the knock on effects is consistent and regular improvements in health and fitness. We regularly have social events, whether it is within the gym or outside of the gym. One of our proudest moments as a facility and community has happened this month where, together, we raised over £2,500 for a local homeless shelter by rowing over 2 million metres as a collective in 30 days. Knowing that we are able to have a positive impact on our local community as well as within the gym makes ION Strength and Conditioning a special place to be.